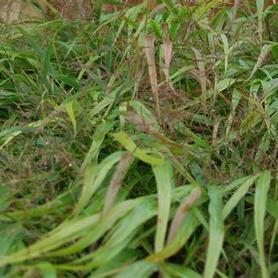 Hakone Grass has graceful green foliage, like miniature bamboo. Soft, airy seedheads form in late summer. Fall and winter foliage color is tan. The tallest of the Hakonechloas, Andrew Bunting of the Chicago Botanic Garden describes it beautifully as "catching (the) wind and flow(ing) like a rolling wave." 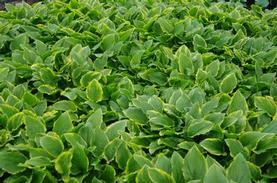 PRN Preferred: Vigorous but graceful, an excellent shade groundcover. The bright yellow spiky foliage of Gold Hakone Grass is more upright than H. 'Aureola'. This grass really lights up shady spots, especially when covered with delicate seedheads. This is Bruce Crawford's favorite Hakonechloa for a number of its attributes. Fall and winter color is tan. 'Fuego' Sneezeweed is an attractive compact late summer bloomer from the Mariachi™ series hybridized by Arie Blom of the Netherlands. 'Fuego' is covered with vivid orange to yellow daisy-like flowers set off by interesting brown center cones, from July to September. 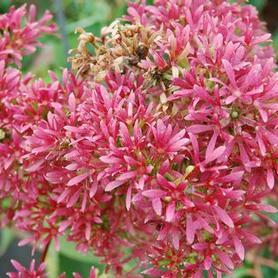 The compact plants flower heavily, attracting butterflies and other pollinators to the showy display. 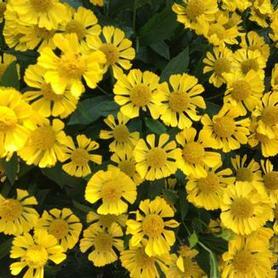 A tough, maintenance-free perennial that is very cold tolerant. 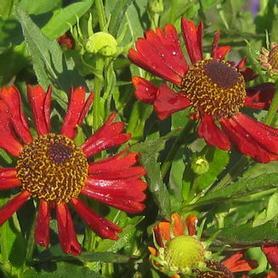 ‘Siesta’ Sneezeweed is another compact introduction from Arie Blom, with bronze cones surrounded by burnt red petals throughout mid-to-late summer. The flower production is excellent especially for its shorter habit. 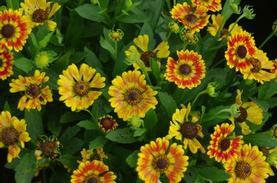 'Sombrero' Sneezeweed is another lovely compact Helenium from Arie Blom's Mariachi™ series. Blooming profusely in mid to late summer, 'Sombrero' is topped with bright yellow daisy-like flowers with darker yellow domed centers. The upright compact habit and prolonged bloom period make Helenium 'Sombrero' an excellent choice for mixed sun containers. It is also a great pollinator attractant in mixed perennial borders. 'First Light' Swamp Sunflower has a solid mass of bright yellow daisy-like flowers in September, which make an amazing fall show. 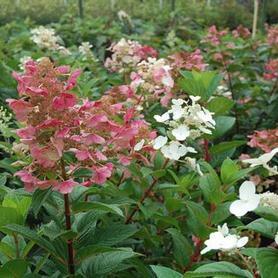 This selection comes by way of New Zealand via Blooms of Bressingham®. Joe Marano of Marano's Garden Center in Fort Washington, PA first showed us this plant. 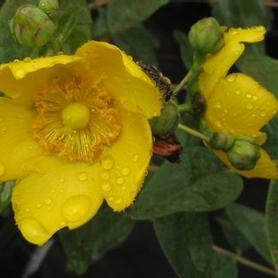 PRN Preferred: Has a compact habit and blooms very late in the summer. 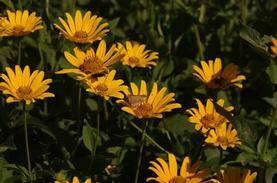 Ox Eye False Sunflower produces masses of 2” bright yellow daisy-like flowers through a good portion of the summer. This prairie native tolerates a wide range of soil conditions, from moist clay to drier meadows and edges of woods. The flowers provide excellent food for finches following the bloom period. 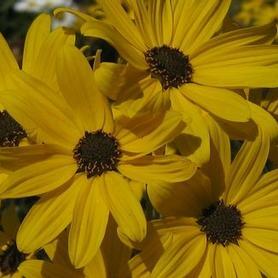 Since Heliopsis seeds itself readily in a variety of soils, it is an excellent plant for naturalizing. 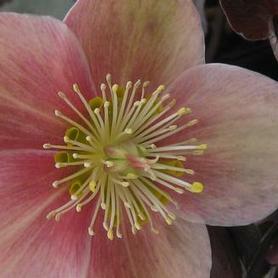 Frostkiss® Pippa's Purple® ('RD9') Lenten Rose is crowned with merlot flowers in February to April. 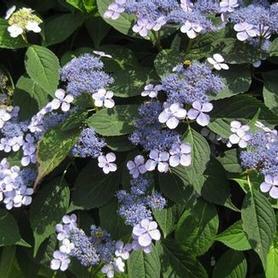 The large blooms have deep purple speckling and the evergreen foliage is a deep green overlaid with silver mottling. 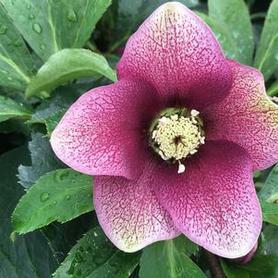 Another beauty from the work of English Hellebore hybridizer, Rodney Davey. 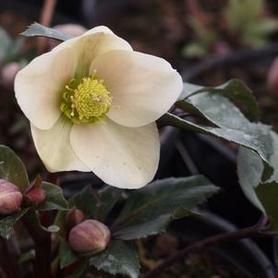 'Ivory Prince' ('Walhelivor') Hellebore produces burgundy-pink buds in March which quickly mature to creamy white open flowers. The blooms last until May, changing to pink and green tones as they age. 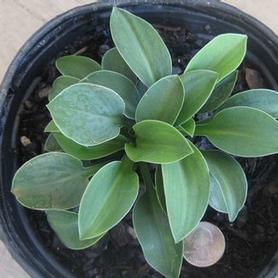 The evergreen leathery leaves have silver veins, but should be removed when flowering is well underway as the new growth looks much more attractive by that time of year. 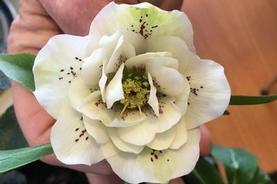 Helleborus x 'Ivory Prince' is a complex hybrid bred in England. The white, pink, rose and burgundy flowers of Royal Heritage™ 'Strain' Lenten Rose bloom in winter, from early March to April. An evergreen perennial from the great plantsman John Elsley, formally of Wayside Gardens. Does well in dry sites. 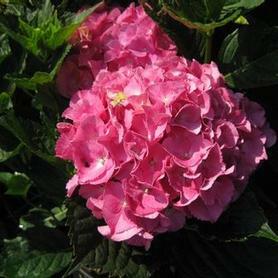 PRN Preferred: Very reliable bloomer with excellent foliage. 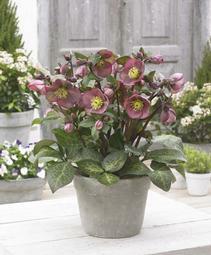 ‘Bushing Bridesmaid’ Lenten Rose is part of the Wedding Party™ Series, bred by Hans Hansen. 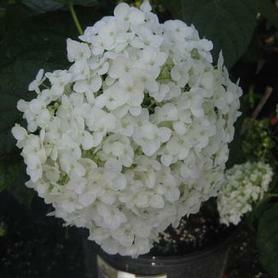 The blooms resulting from this series are all double. ‘Blushing Bridesmaid’ produces double white flowers veined with fine raspberry stripes and edged with dark raspberry picotees. The blooms are large and displayed above clean evergreen foliage. 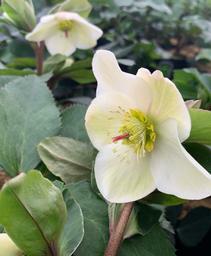 'Camelot' ('Coseh 940') Gold Collection® Ballard Hellebore is a great winter and spring blooming perennial, producing dusty pink buds which open to cream flowers on short strong stems. 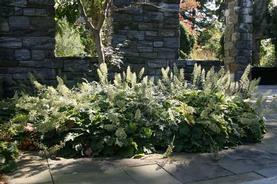 The glossy foliage is evergreen and deep green in color, making an attractive, long lived addition to shade gardens throughout the year. 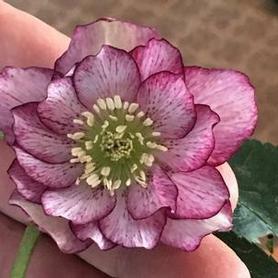 All the HGC Hellebores come from Heuger breeding program in Germany. 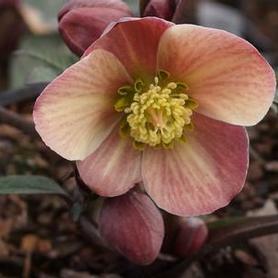 'Cinnamon Snow' ('Coseh 700') Gold Collection® Ballard Hellebore blooms from December to March. The buds start pink and open to shades of cream, rose and cinnamon. As the flowers age, they take on tons of pinkish green. The dark green evergreen leaves are attractive throughout the year, especially since they are held up on reddish stems. 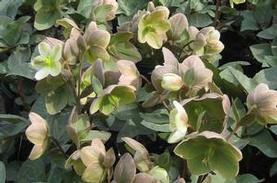 Hellebores make an excellent long lasting addition to shade and woodland gardens. 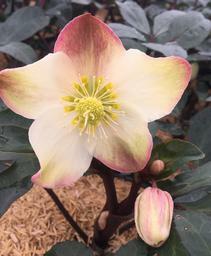 'Mahogany Snow' ('Coseh 930') Gold Collection® Ballard Hellebore starts blooming in January and continues into March. 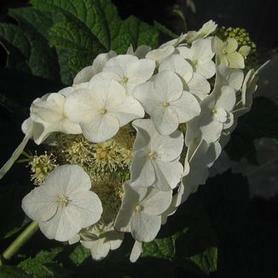 The outward-facing white flowers have strong pink backsides to the petals, and are displayed above lustrous dark green leaves. 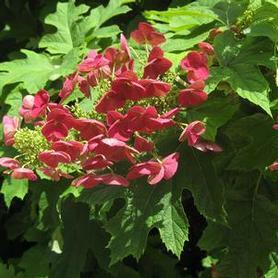 The stems of the flowers and foliage are reddish and sturdy. As the blooms age into spring they take on subtle hues of pink and green, delivering a long stretch of beauty in the perennial shade garden. 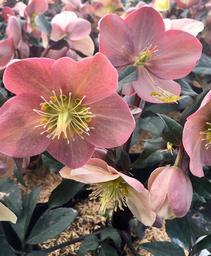 'Merlin' ('Coseh 810') Gold Collection® Ballard Hellebore adds a colorful element to the winter landscape, bearing soft pink flowers which face upward, displayed on wine-red stems. 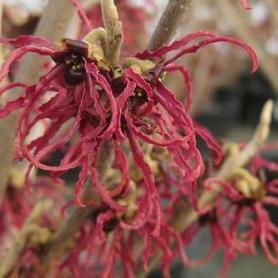 As the blooms age over several months they become a deep cranberry color, followed by pinkish-green at the end of the season. The deer resistant evergreen foliage is a dark glossy green. Prefers moist but well drained shady locations. 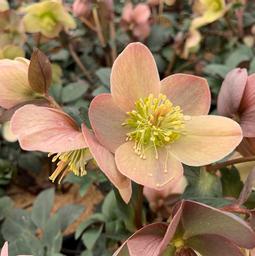 'Pink Frost' ('Coseh 710') Hybrid Lenton Rose is part of the HGC® (Hellebore Gold Collection®) series, with a multitude of pink flowers in March. They are displayed above green evergreen leaves which are accentuated by a silver netting, and as they age, their blooms age to a deep rose color. The flowers last for a very long period, and the sturdy clumps grow larger every year. 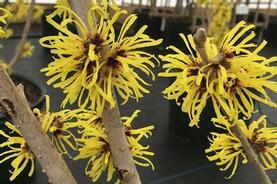 An introduction from Heuger Nursery in Germany. 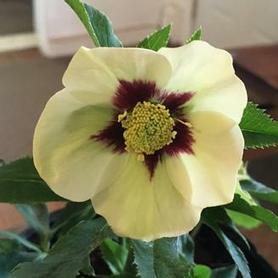 'Shooting Star' ('Coseh 790') Gold Collection® Hellebore produces dusty rose flower buds in March which open to lovely large white open faced blooms. In April and May, the sepals age attractively to shades of sage green. 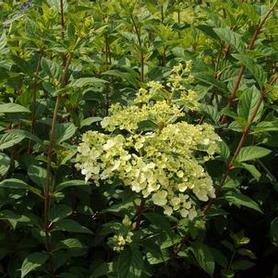 The evergreen foliage adds to year round interest, as the deep green leaves have prominent lighter silvery veins, displayed on dark red stems. 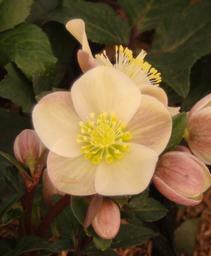 'Love Bug' Gold Collection® is a compact evergreen Hellebore from Heuger's exciting breeding program. The abundant pink buds appear in late winter, opening to white with a blush of soft pink. 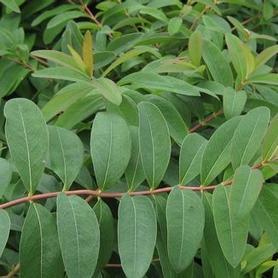 The lustrous dark green leaves have silver veining and wine red stems. 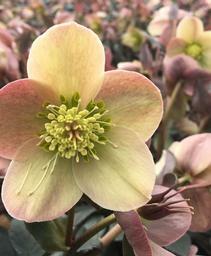 Helleborus 'Love Bug' is similar to H. 'Pink Frost', but the form is more compact and floriferous. The compact habit and long blooming time make 'Love Bug' an excellent candidate for winter containers. Ice N' Roses® 'White' Gold Collection® Snow Rose is one of the exciting new glandorfensis hybrid series of Hellebores from Heuger in Germany. 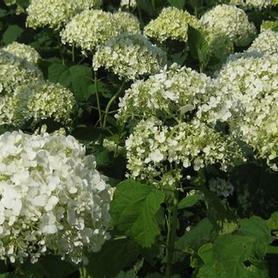 The series range from white to dark red, and this selection was chosen for its large number of white outfacing flowers starting in December. The lustrous evergreen foliage is dark green and looks beautiful in winter containers as well as is shade gardens. 'Autumn Minaret' is a very unusual Daylily because of its late bloom time (August and September) and its extreme flower height. The yellow to orange delicate scapes are somehow old fashioned looking, but they tower above the short green strap-like foliage. This unsual Daylily blooms for an extended period and actually looks much more like a native wildflower than you expect a Hemmerocallis to look. 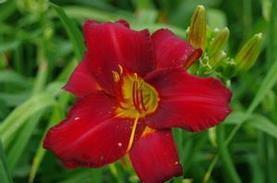 PRN Prefered: The natural and late flowering blooms make this one of our favorite daylilies. 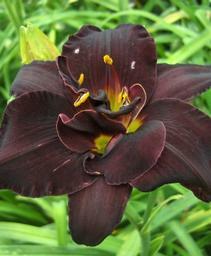 'Bogeyman' Daylily blooms in June, producing large double flowers which are dark purple bordering on black. The intense color is set off by a hint of a chartreuse eye. 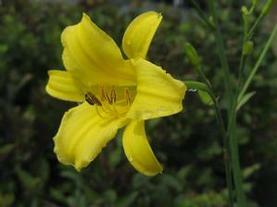 Hemerocallis 'Bogeyman' is considered to be an "early to mid season" bloomer. 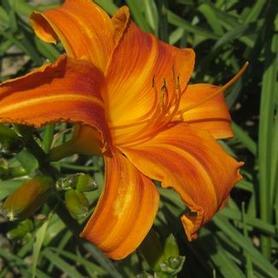 'Bold Tiger' Daylily has bright orange recurved petals that have a large red eye. Hemerocallis 'Bold Tiger' is a mid season bloomer with some fragrance. 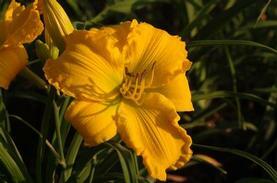 'Buttered Popcorn' Daylily has huge butter-yellow flowers, and is a very reliable rebloomer. The flowers are large and of thick substance. PRN Preferred: A huge and plentiful flower display, really makes an impact. Reblooms in fall. 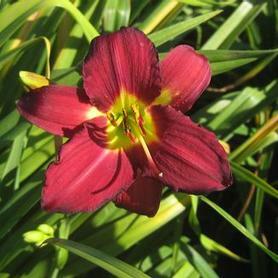 'Chicago Apache' Daylily has big red flowers, and is a mid to late season bloomer. Very noticeable when in bloom. 'Garden Show' Daylily produces 6" lavender mauve flowers mid season, followed by a late summer rebloom. The fragrant flowers display large lemon green eye zones, and attract butterflies and other pollinators. 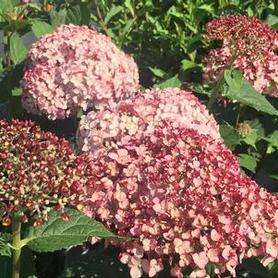 Hybridized by Carpenter, and an excellent plant to withstand urban conditions. 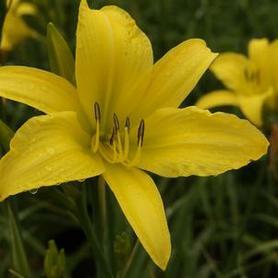 'Happy Returns' Daylily has lemon yellow flowers. 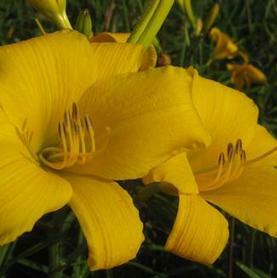 It is an early flowering rebloomer and is the best of the reblooming yellows, from the great Daylily king, Dr. Darrel Apps. 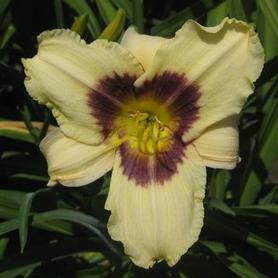 'Hyperion' Daylily is a lovely, old fashioned Daylily that is fragrant. Lily-shaped lemon-yellow flowers are held high above the foliage. A mid-season bloomer. 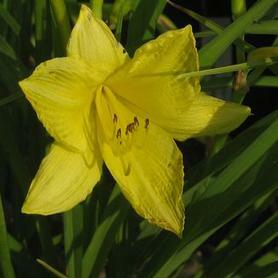 'Jen Melon' Daylily has large golden yellow flowers appearing mid to late season in summer. 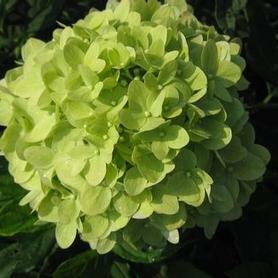 The 7" flowers are ruffled and attractively recurved, making a wonderful show in the mid summer landscape. 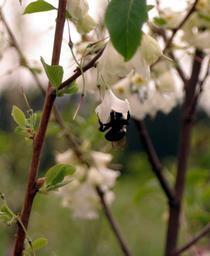 The fragrant blooms attract butterflies and other pollinators. In the morning as the diploid flowers are opening, they have deeper tones reminiscent of cantaloupe (hence the name 'Jen Melon'). A very showy addition to urban gardens, where its tolerance for poor soils and pollution is very useful. Hybridized by Oakes. 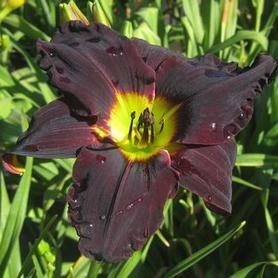 'Jungle Beauty' Daylily has huge black-red diploid flowers with yellow-green throats. It is a Dr. Darrel Apps introduction that keeps its deep color well in the full sun. PRN Preferred: Velvety burgundy flowers seem to absorb light. 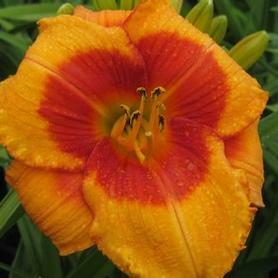 'Krakatoa Lava' Daylily is spectacular, with large bright orange flowers that have an orange-red halo. A mid to late season bloomer, it has thick petals because it is a tetraploid. 'Pandora's Box' Daylily has ruffled cream-colored petals which are set off by a big cranberry-purple eye on thick diploid flowers. Reblooms well. 'Pardon Me' Daylily has small red flowers, and is a rebloomer. One of the best of reblooming reds, also from Dr. Darrel Apps. We saw this lovely yellow Daylily at Chanticleer Gardens in Wayne, PA (if you haven't visited this wonderful public garden yet, make it a priority). 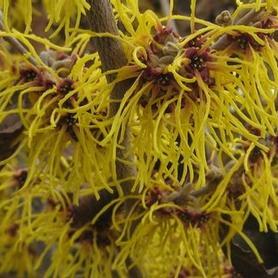 The fragrant simple yellow flowers are very late bloomers and are held on very long stems so they seem to float above the foliage. Graceful and striking, especially in late afternoon light. (Formerly listed as 'Voyle's Unnamed Hybrid', for its hybridizer, David Voyles of Ohio). 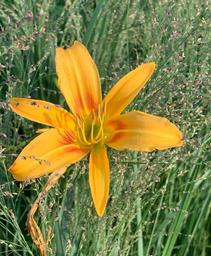 PRN Preferred: Blooms very late when other daylilies have already finished. Very tall stems display the fragrant flowers. 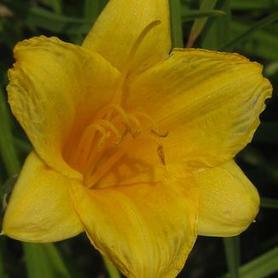 'Stella D'Oro' Daylily has small gold flowers, and is a dwarf form. It is a wonderful prolific rebloomer. This Daylily has some shade tolerance as well. 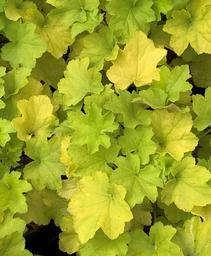 'Green Spice' Alum Root has an attractive overlay of silver on its green leaves. Since the veining is purple-red, the effect is eye-catching. Heuchera americana's tolerance of a wide variety of site conditions makes it a very useful addition to shade gardens and the tall, delicate, ivory-green flower spikes add to the visual interest throughout May and into June. 'Palace Purple' Alum Root boasts deep, shining purple foliage and tolerates some dryness. Flowers are small ivory spikes in early summer. 1991 Perennial Plant of the Year. 'Caramel' is an exciting H. villosa cross that has striking apricot leaves with reddish undersides, turning to salmon-red in fall. 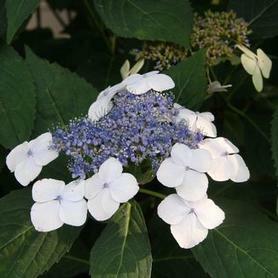 Creamy white flowers appear in late summer. From Thierry Delabroye of France. 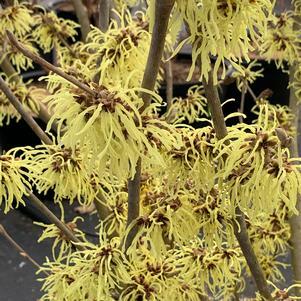 'Citronelle' is another wonderful H. villosa cross with vivid chartreuse foliage and small white flowers. 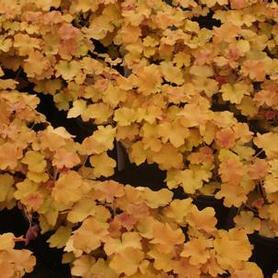 A sport of 'Caramel', it has all the endurance qualities of its villosa parentage. Another great introduction from French breeder Thierry Delabroye. 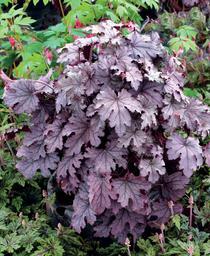 The beautiful wine-red leaves of Heuchera x 'Fire Chief' become darker as they age, making a vivid contrast between newer and older leaves. 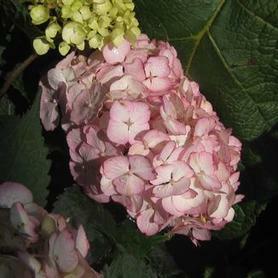 Flowers are pink and white on red stems, and appear throughout spring and summer. 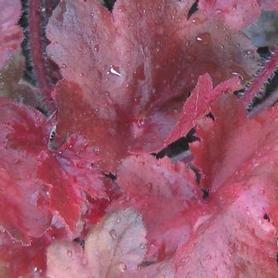 Heuchera x 'Fire Cheif' is one of the Front & Center™ series of Coral Bells. ‘Frosted Violet’ Coral Bells is a resilient Heuchera which has been around for a while and still justifies its use in the garden. 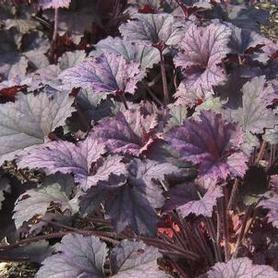 The leaves are violet-burgundy, with darker veins and a delicate silver overlay. The spring flower spikes are white and subtle. 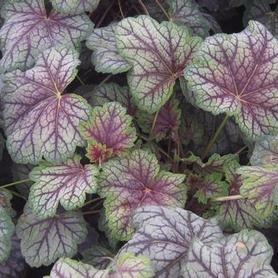 Heuchera ‘Frosted Violet’ was hybridized by Charles Oliver of The Primrose Path. 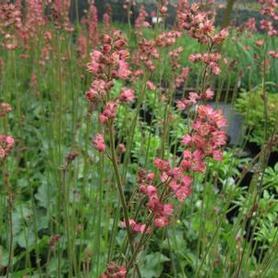 The large rosy red flowers of 'Paris' Coral Bells appear throughout the summer, floating over silver-green foliage. 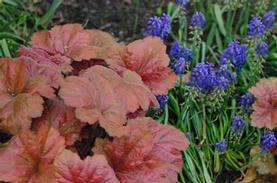 This Heuchera really reblooms. 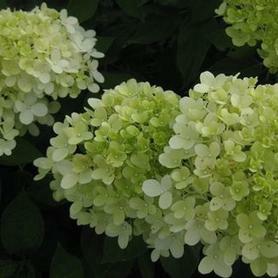 PRN Preferred: Huge, eye-catching flowers held high above the foliage when in bloom. 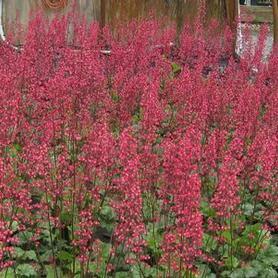 'Raspberry Regal' Coral Bells has large raspberry pink flower spikes which are held upright on strong stems in June and July. The leaves are dark green overlaid with attractive silver mottling. 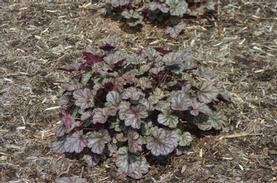 Heuchera x 'Raspberry Regal' tolerates sunny locations better than most Coral Bells, as long as the soil moisture is good. The unusually full flower spikes make excellent cut flowers, and 'Raspberry Regal' reblooms well if deadheaded after the first flush of blooms. 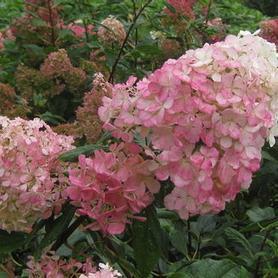 Introduced by Busse Gardens of Minnesota. 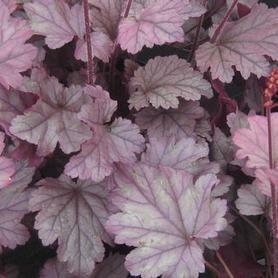 'Rave On' Coral Bells has a great production of deep pink flowers in spring, over purple and green leaves with a beautiful silver overlay. Heuchera x 'Rave On' produces showy flowers over a long period of time, and is one of the Front & Center™ series of Coral Bells. PRN Preferred: Produces showy flowers for a very long period of time. 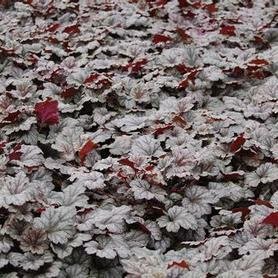 'Silver Scrolls' Coral Bells has inconspicuous white flowers, beautiful silver-maroon foliage, and is quite sun tolerant. A Primrose Path introduction, resulting from Charles and Martha Oliver's groundbreaking work in hybridizing. ‘Stainless Steel’ Coral Bells comes from the excellent breeding work of the Olivers of the Primrose Path, so it copes very well with East Coast conditions. 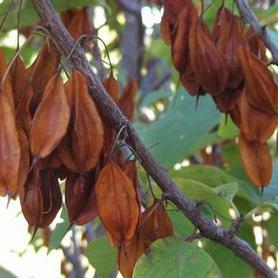 The large leaves are a steely silver with dark veins and stems. The undersides of the leaves are a beautiful deep purple, adding to the appeal of ‘Stainless Steel' when blown by breezes. 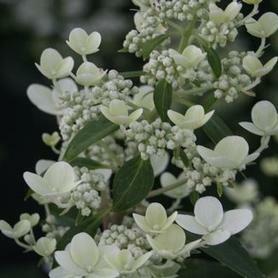 The attractive white flowers hover above the foliage in late spring and early summer. 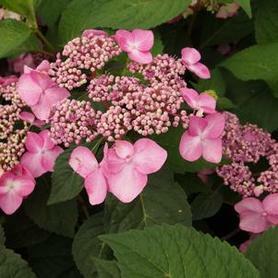 'Plum Cascade' Foamy Bells is one of the Cascade™ Series from Terra Nova Nurseries. 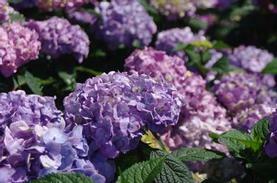 Its purple and silver leaves are a color breakthrough, as is its prolonged blooming time of spring and late summer. 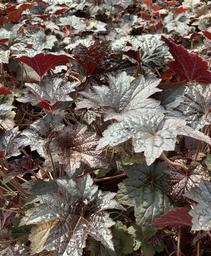 The flowers are delicate light pink spikes above the foliage, and the habit is trailing, so Heucherella 'Plum Cascade' can be used as a shady site groundcover. 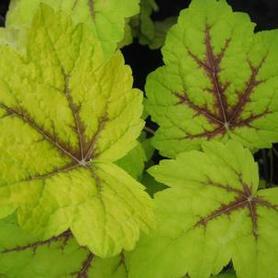 'Stoplight' Foamy Bells has chartreuse-yellow foliage with a red center blotch in spring which changes to straw and green with a burgundy center in summer. It is topped by white flowers in spring. 'Tapestry' Foamy Bells has deeply lobed green leaves with a dramatic burgundy overlay in the center. Flower spikes are dusty pink in spring. 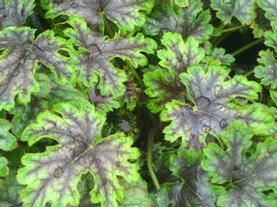 A vigorous cross between Heuchera and Tiarella which resembles its Tiarella parentage most clearly. 'Kopper King' Common Mallow has large white flowers with a red eye in July above striking copper-burgundy foliage. 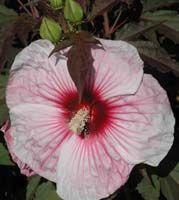 It loves wet sites, and is from the great Hibiscus people, the Fleming Brothers. 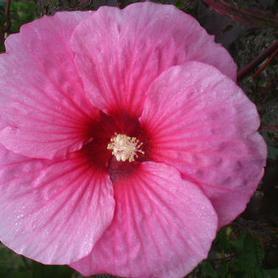 'Lady Baltimore' Common Mallow has large pink flowers with a red eye on tall stems in July. Does well in wet sites. From Robert Darby. Lord Baltimore' Common Mallow has large red ruffled flowers on tall stems in July. Does well in wet sites. From Robert Darby. 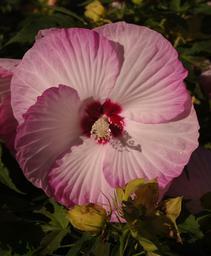 Luna™ 'Rose' Common Mallow produces quantities of 8" rose pink flowers on sturdy compact plants. 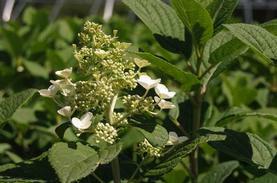 The foliage is green making a good setting for the vividly colored blooms in July and August. 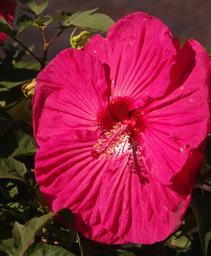 Hibiscus are great mid to late summer food sources for Hummingbirds and pollinators. Luna™ 'Rose' is a good choice for wet sites such as bioswales, rain gardens and wet meadows. A Kieft Seed introduction. Luna™ 'White' Common Mallow produces very large white flowers with bright red centers in July and August. 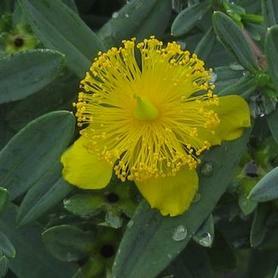 The habit is compact, with clean green foliage on sturdy stems. Hummingbirds and butterflies love the flowers. 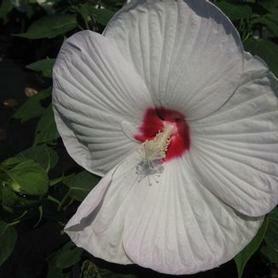 Luna™ 'White' Hibiscus thrives in wet locations, but will also do well in somewhat dryer sites. 'Mars Madness' Common Mallow has large maple shaped foliage that emerges in shades of bronzy purple and matures to olive green. 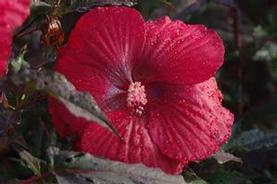 This showy Hibiscus is 4' tall, and it produces 8" flowers all along the stems in mid to late summer, resulting in a quantity of magenta red blooms. Although Common Mallows are originally a native wetland plant, Hibiscus 'Mars Madness' also thrives in average soil as well as wet sites. 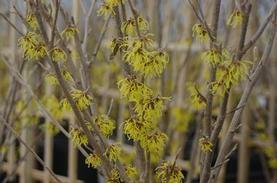 Deer resistant, cold tolerant and long flowering; this Walters introduction is a winner. 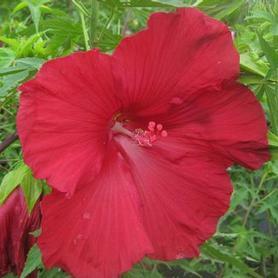 'Midnight Marvel' Common Mallow is a beautiful combination of huge deep red flowers and deep burgundy foliage. 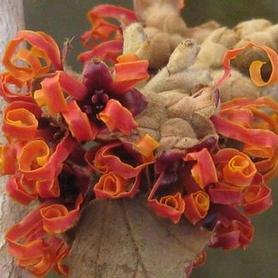 The large wine colored leaves are maple shaped, held on sturdy stems. 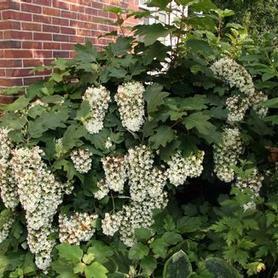 'Midnight Marvel' blooms for a prolonged period in July, attracting native insects to its pollen supply. 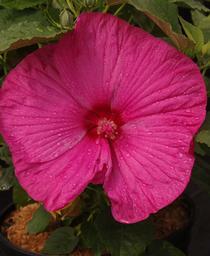 Like other common Mallows, Hibiscus 'Midnight Marvel' is highly wet site tolerant. 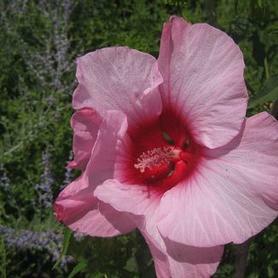 'Summer in Paradise' Rose Mallow starts blooming in July and produces enormous deep pink flowers through the rest of the summer. The blooms appear all over the green stems rather than just at the tips, making an impressive show. The centers of the cerise pink flowers are set off by deep red eyezones. 'Summer in Paradise' flourishes in wet sites, and adds a striking tropical note to bog gardens, bioswales and pond edges. From Walters Gardens. Summerific® 'Ballet Slippers' Rose Mallow has 7" ruffled white flowers edged with soft pink and accented by a deep red eye. The green maple-like foliage is clean and disease free. 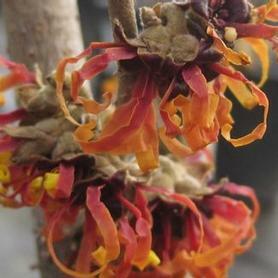 Flowers are produced along the branches rather than just at the tips, making a showy tropical effect. 'Ballet Slippers' comes from Walters Gardens prolific breeding program, and is a wonderful addition to wet sites and large scale perennial gardens. Summerific® 'Holy Grail' Common Mallow starts blooming in July and produces a large quantity of deep red 8" flowers through early fall. 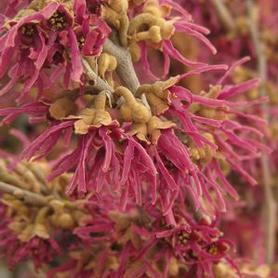 The flowers are set off by the purple to black maple-shaped leaves, making for a vividly showy tall perennial in the garden. Hibiscus 'Holy Grail' is highly tolerant of wet sites, so it is a great addition to ponds, bioswales and sunny rain gardens. Another amazing beauty for Hans Hansen of Walters Gardens. 'Summer Storm' Common Mallow combines a number of beautiful characteristics, with 8" pink flowers with magenta centers, over burgundy maple-shaped leaves. 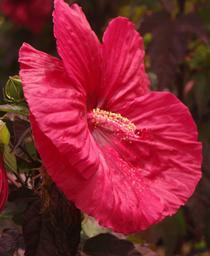 It is a mid-sized plant, and like the other Hibiscus, it is wonderfully water tolerant. It blooms from July to September. 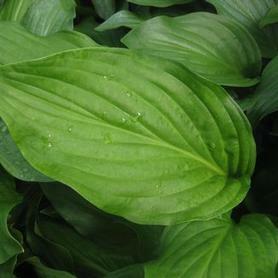 Hosta 'Big Daddy' has large, blue foliage, and white bell shaped flowers in summer. 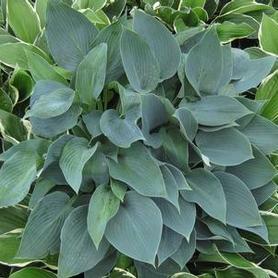 Hosta 'Blue Angel' has large, blue-green foliage, and white bell-like flowers in mid-summer. A Paul Aden introduction, this cultivar is very resistant to Hosta Virus X.
Hosta 'Blue Cadet' has small, blue foliage, and lavender trumpet-shaped flowers in July. A compact, refined looking Hosta for small spaces. 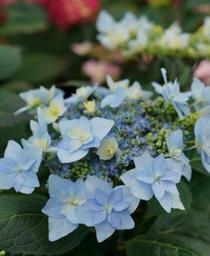 The thick heart-shaped, grey-blue leaves of 'Blue Mouse Ears' grow in a perfect compact mound. The lavender flower spikes are also small and neat. This Plantain Lily is particularly attractive for a small shade garden. 'Blue Mouse Ears' is a sport of H. 'Blue Cadet'. 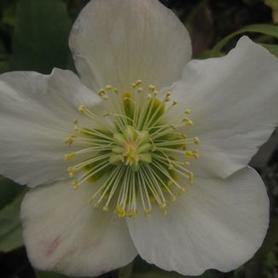 A lovely sport of 'Halcyon', but with showy white margins setting off the glaucous blue leaves. The flowers are lavender and appear in mid summer. We first saw this beauty at Meadowbrook Farms in Pennsylvania when it first came out, and bought every one for our own garden. PRN Preferred: The contrast between the ivory margins and blue centers is beautiful. 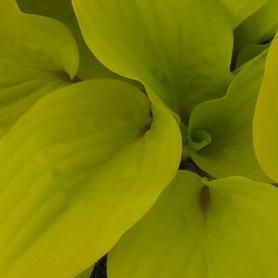 'Empress Wu' Plantain Lily is considered the largest Hosta available. The enormous green leaves are corrugated and have a faint blue coating in spring. Lavender flowers appear above the foliage in July and August, often attracting Hummingbirds. 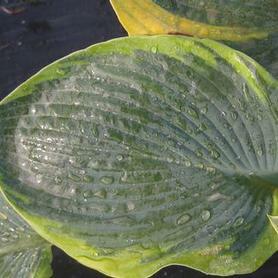 Hosta 'Empress Wu' is a seedling of Hosta 'Big John', which was bred by Brian and Virginia Skaags. Be patient, as it takes several years for 'Empress Wu' to reach its final amazing size. Named after the only female empress of China (624 AD to 705 AD). 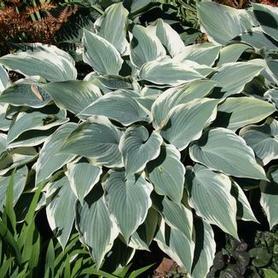 The leaves of 'Fire and Ice' Hosta are very striking with wide, bright white centers surrounded by dark green margins. The blooms appear in July and are a pale lavender. 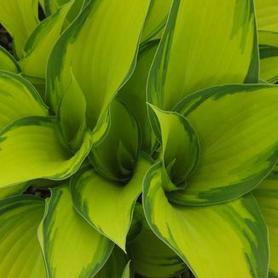 The vivid yellow textured leaves of Hosta 'Fire Island' have red petioles, especially showy in spring and early summer. Leaf color changes to a chartreuse-green as summer progresses, topped by lavender flowers in July. PRN Preferred: We love the combination between the yellow leaves and red stems. A great "pop" of color in spring. 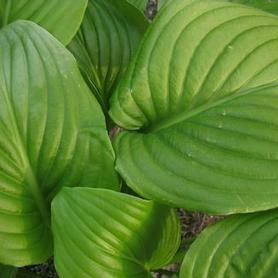 The blue-green leaves of Hosta 'First Frost' have creamy-yellow margins which turn to white by mid summer. 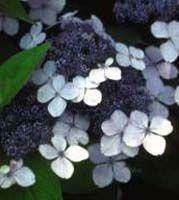 It has pale lavender flowers, and is a sport of 'Halcyon'. 2010 Hosta of the Year. 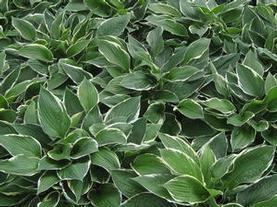 Hosta 'Francee' has medium-sized, green and white foliage with late season lavender flowers. A variegated Plantain Lily which is a real workhorse in the garden. 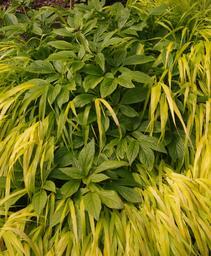 Hosta 'Frances Williams' has medium-sized yellow, blue and green foliage and white flowers in June. 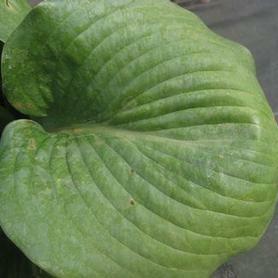 A mutation of H. sieboldiana 'Elegans', this cultivar is very resistant to Hosta Virus X. 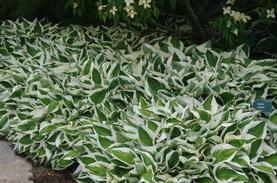 The fragrant lavender-white flowers of Hosta 'Guacamole' appear above apple-green leaves with dark green margins. The center of the leaves turn gold in summer. 2002 Hosta of the Year, a Bob Solberg introduction. 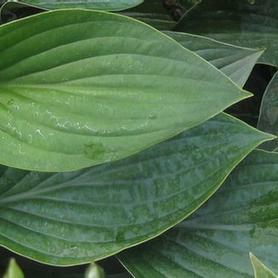 The thick silvery blue-green leaves of Hosta 'Halcyon' are more slug resistant than most Hostas. 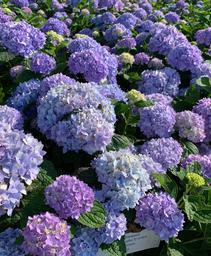 Flowers are pale lavender-blue in mid summer. PRN Preferred: The thicker, upstanding leaves hold up well. 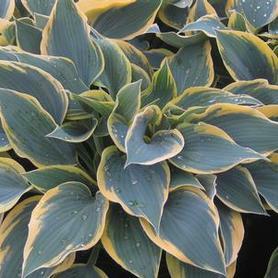 Hosta 'June' has medium sized gold, blue and green foliage, with lavender flowers in July. A sport of H. 'Halcyon' from England, 2001 Hosta of the Year. 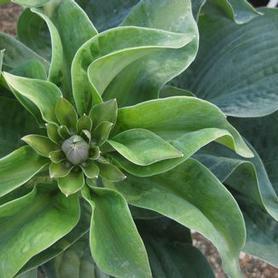 Hosta 'Patriot' has medium-sized white and green foliage, and lavender bell-like flowers in mid summer. A sport of H. 'Francee', found by Mobjack Nursery. 1997 Hosta of the Year, and more sun tolerant than most Hostas. 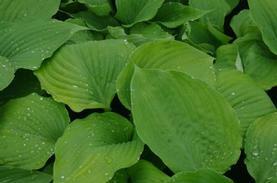 The medium green foliage of Hosta 'Royal Standard' is topped by fragrant white lily-like flowers in July and August. Makes a great cut flower. 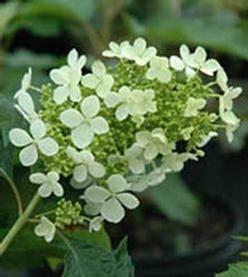 PRN Preferred: We love the contrast of dark green leaves and showy fragrant white flowers. 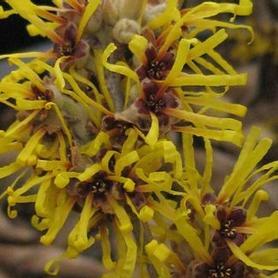 Customers are often surprised when they discover how fragrant this variety is in the garden. 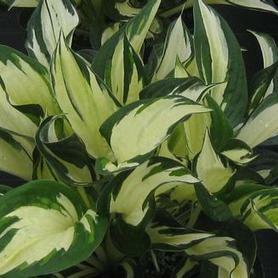 Hosta 'So Sweet' has fragrant white flowers in August above green and yellow foliage. A Paul Aden introduction and 1996 Hosta of the Year. 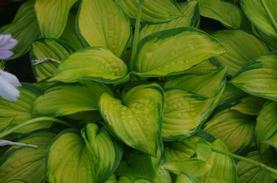 Hosta 'Stained Glass' was an introduction by the great Hosta breeder, Hans Hansen. 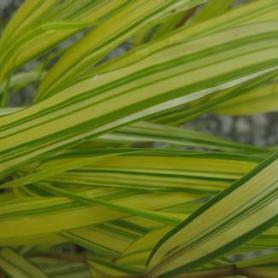 Found as a mutation of H. 'Guacamole', the large glossy leaves are a striking yellow-gold set off by a wide deep green margin. The prominent veining is evidently what triggered the name 'Stained Glass'. 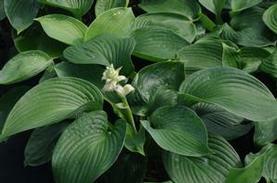 This very showy large Hosta produces very fragrant pale lavender flowers in August and September. Our Lisa Strovinsky first sang its praises and started us growing this beauty. PRN Preferred: Very showy patterns of yellow and green on textured leaves. August Lily has huge white fragrant flowers, held above large, green foliage, hard to find! The flowers look like small white lilies, lighting up the shade garden in August. They perfume the evening air near them. 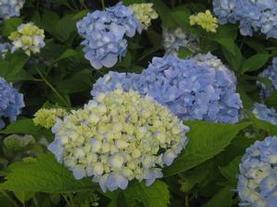 Huge, blue-gray corrugated leaves followed by tall white flowers in July. 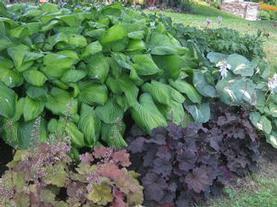 One of the best-beloved large blue Hostas, and one which has proved to be very resistant to Hosta Virus X. 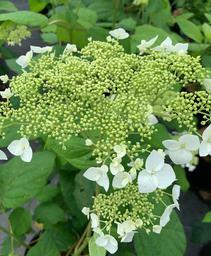 The white flat hydrangea flowers of Climbing Hydrangea appear in mid summer. 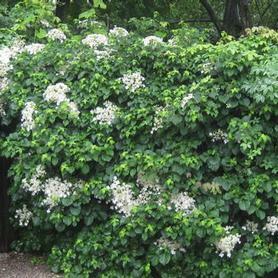 It is a vigorous woody vine for sun and shade locations. 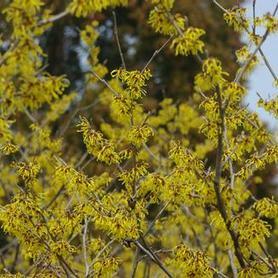 Fall color is yellow and exfoliating bark adds winter interest.